It is very hard to find a 7" display which is readable in direct sunlight and has less power consumption. At my intensive research for such a display, I only found the Pixel Qi. This transflective panel has only a brightness of 270 nits in a darkroom, but it is perfectly readable in sunlight and only has a power consumption of 2 Watts. The display is a very fragile part and you should protect it from environmental stress. So I need an acrylic glas which has a special treatment to minimize mirroring and reflection. For this application I found a 2mm thick acrylic glas with ultimate glare reduction and non glare coating for absolute minimum reflectance. Normally, between the display and the protecive glas is a little air gap. This gap would not only effect reflecting the sunlight on the suface of the acrylic glas, but also on the suface of the display. So the best protective glas is useless if you do not fill this gap with a special optical adhesive. On the internet I found some manufacturers for this glue (UV adhesive), but no company that will bond me one display for development purpose. So I decided to do it on my own. At first I had to look for a special UV curing lamp, but I only found professional systems which are very expencive. 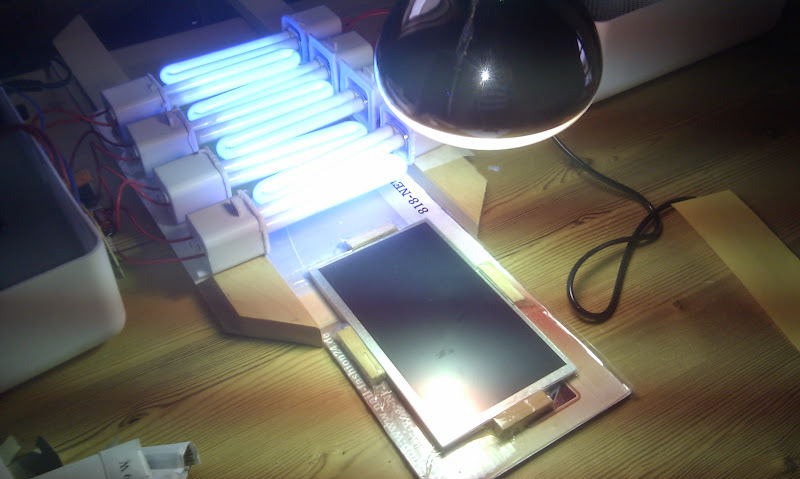 That´s why I bought two UV curing boxes for nail polish on eBay and rebuild the lamps to get a uniform irradiated area at the size of the display. The second barrier was to find a place with less microscopic dust. After these initial problems, the bonding of the display was very good without bubble and dust.